Today, my dad and I went to explore the new IBM THINK Exhibit at Lincoln Center here in NYC. We were greeted at the entrance by the very familiar (my father is a retired longtime IBMer) ‘THINK’ logo, still looking fresh today in the same slab serif type that I remember from the 1960s. 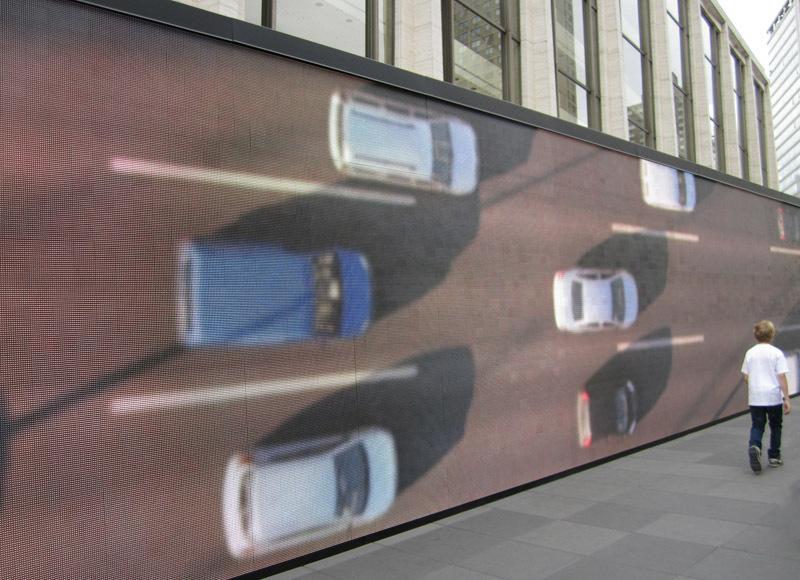 The exhibit is in celebration of IBM’s 100th anniversary and illustrates – via multimedia – the possibilities that science and information technology offer to ‘make the world work better.’ Beginning with its 123-foot digital visualization wall which streams real-time data from the surrounding Lincoln Center area with respect to traffic, air quality and water consumption, to its interior 12 minute immersive film, which then converts to multi-panel interactive walls mostly displaying the changes in science, technology and comparisons in the way we display information in the past and today. It’s all beautifully executed. The Data Wall, in particular, is mesmerizing. Designed by the transmedia studio Mirada (started by director Guillermo Del Toro) in conjunction with a team of mostly faculty and graduates of the UCLA Department of Design Media Arts who designed the software, it’s a perfect example of art and science merging; animated infographics at their best. Also quite lovely, are the print exhibition graphics throughout the exhibit that are clearly a nod to the great Paul Rand. The IBM THINK Exhibit is on the inclined Jaffe Drive at Lincoln Center through October 23, 2011. 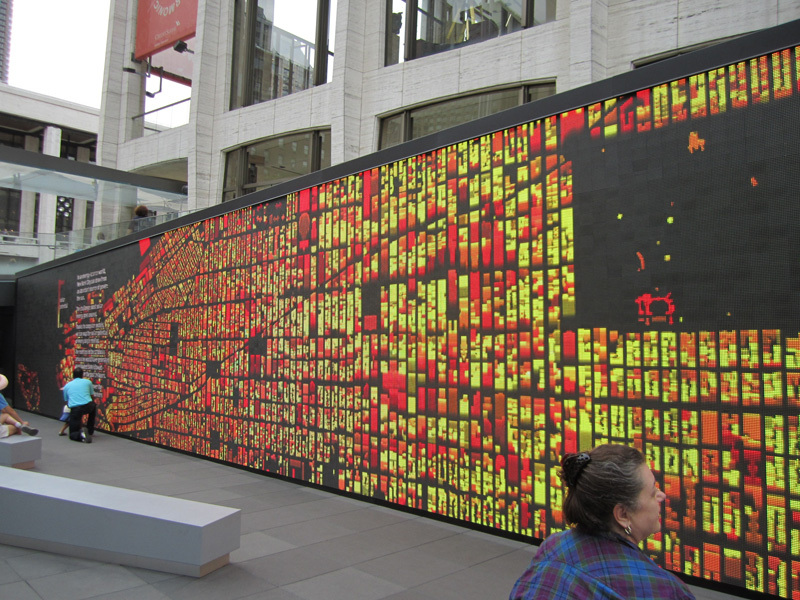 It’s hard to miss the spectacular digital wall from Broadway. This entry was posted in Event, Graphic Design, Interaction Design, Just Plain Cool, NYC, Stuff We Like. Bookmark the permalink.